Click here for more tables and figures, including added text detail on UV LED characteristics. Floor coating compositions were prepared from monofunctional, difunctional and trifunctional acrylates, as well as urethane acrylates (UA), and used to determine the effect of double-bond equivalent weight (DBEW) mercapto-based resin, high-viscosity UA and LED photoinitiators on final cured film properties when cured under an atmosphere of air vs. nitrogen. The least amount of yellowing was observed using a combination of TPO/ITX as the UV LED photoinitiator package. Scuff, stain and abrasion properties sought in floor coatings were met using LED/UV 365 nm and 385 nm lamps. The use of nitrogen inerting resulted in an improvement in surface properties, such as stain resistance and scuff resistance. Thermal and mechanical properties, such as tensile elongation and storage modulus, are described. Armstrongs first UV-cured floor coating was introduced in 1976, and coating systems that provide improvements in resisting stains and abrasions have continued to evolve for the past 40 years. In 1976, the company introduced its first UV-curable coating, purchased from W.R. Grace, based on thiol-ene chemistry for Solarian tile. The coating brought to market a no-wax do it yourself installation. This encompassed the reaction between difunctional norebornenes with R = 6 with tetrathiol. A schematic of the thiol-ene cure process is shown in Figure 1. These systems cured quite well due to the nature of the thiol-ene reaction that mitigated oxygen inhibition1,2. As published by Hoyle and Johnson, oxygen has little effect on the polymerization rate of thiol-ene free radical polymerization process. Upon addition of oxygen to the carbon-centered radical formed from the radical propagation step, the peroxy radical readily abstracts a hydrogen from the thiol, producing a thiyl radical that adds to the carbon-carbon double bond, thereby reinitiating the propagation step (Scheme 1).3 These successes with the photoinitiated polymerization of thiol-enes led to the first truly large-scale uses of radiation curing in the US, ensuring the expanding future of this green technology. For a wide variety of reasons, both economic and technical, thiol-ene photocuring gave way to acrylate-based photocurable systems. Objections at the time to thiol-ene-based ultraviolet-curable resins included odor, as well as the incorrect perception that all thiol-ene coatings were subject to rapid yellowing and discoloration upon weathering. Coating requirements for flooring are very different from requirements of other coating systems used in the UV/EB industry for inks, varnishes, furniture and plastics or wall coverings. Several surface properties of the coating must be retained after UV-initiated polymerization, including resistance to common household stains; ease of surface cleaning after spills; extended wear and scuff resistance to rubber heels or other types of footwear; and ability to retain original aesthetics after everyday wear from foot traffic. This paper will explore methods to mitigate oxygen inhibition by utilizing reactive chemicals and nitrogen atmosphere to improve surface cure for UV/LED cured floor coatings. The types of materials studied can be broken down into high-viscosity urethane acrylates, mercapto-modified polyester acrylate resin and LED photoinitiators within a base formulation for each series of formulations (Tables 1, 2). Within these comparative studies using a base formulation with the same materials, the effect of atmosphere processing conditions (i.e., air vs. nitrogen) on degree of cure; glass transition (Tg); mechanical properties; and scratch, scuff and stain performance will be described. Properties of cured UV/LED coatings include double-bond conversion determined by FTIR, mechanical tests to determine percent elongation at break, DMA properties to determine level of cross-linking and thermal analysis to determine glass transition temperatures. Effect of double-bond equivalent weight (DBEW) within the formulation on degree of cure, mechanical testing and performance data (Table 3). Effect of photoinitiator type: phosphine oxide-based TPO, TPO-L vs. 3-ketocumarin on cure of LED formulations (Table 4). Effect of high-viscosity urethane acrylate and thiol-based acrylate on LED cure (Table 5). Materials used in this study are designated in Table1. Tables 2 through 5 show the various formulations used in each of the four studies. Table 2 summarizes the UV-cured formulation used in this study for comparison to LED/UV cured formulations. Table 3 shows the formulation composed of a combination of polyester acrylate; urethane acrylate; and mono-, di- and trifunctional acrylates, along with overall double-bond equivalent weight (DBEW)/gm resin. The DBEW is calculated by dividing the C=C gm equivalent weight for each material by the amount of material (gms) to get equivalents of C=C. The summation C=C equivalents for each material divided by total weight gives double-bond equivalent weight. All additives have been left out of this calculation, including photoinitiators and hard particles. To simplify formulations, the DBEW/g has been multiplied by 1,000 to give a whole number as DBEW/1000g. All performance testing for resistance to scuffs, stains and abrasion was performed on floor tile substrate to isolate the properties of the topcoats. All formulations were coated onto tile substrate using a #6 wire wound rod to give approximately 0.6 to 0.7 mils and subsequently cured by the conditions outlined in Tables 6 and 7. The coated tile substrate or wood was preheated to 85°F after application of coating to allow for flow of the coating prior to UV or LED/UV cure processing. Laminate films were prepared by coating 2.6 mil rigid PVC film with the coating that was mounted on a glass plate before processing. Gloss was measured using a BYK-Gardner 60 degree gloss meter set in statistical mode for a total of 10 measurements to give an average gloss value. Viscosity was measured using a Brookfield RVT Viscometer #6 spindle at 100rpm, 77­°F. Scratch resistance was measured using a modified BYK Gardner abrasion tester. Each coating layer was abraded using a proprietary method. After abrading, each sample was visually assessed using the scale of 1 for minimal damage and 2 for severe damage. The percent gloss retained was calculated based on initial gloss and final gloss after the test. The iodine stain test was conducted by placing a dropper full of iodine (size of a dime) on the substrate and allowing it to remain for one minute. The sample was wiped with a damp rag and the color was measured with a sphere spectrometer from X-rite, Model SP64. The CIE L*a*b* color scale was used for color measurements. A Delta b (Δb) value was obtained (a measure of the difference in b values between the control and a sample) to indicate the degree of yellowing. The degree of yellowing was measured with a calorimeter that measures tristimulas color values of a, b and L, where the color coordinates are designated as +a (red), -a (green), +b (yellow), -b (blue), +L (white) and -L (black). The samples were scanned using a Cary 620 FTIR spectrometer with a diamond ATR accessory with a ZnSe engine. The samples were placed directly on the sample compartment base plate of the spectrometer without a salt crystal. Analysis was performed in absorbance mode, using 64 scans at 8 cm-1 resolution. Degree of double-bond cure for the LED-cured coatings was estimated by comparing the intensity of the IR stretch for the C=C group around 1400 cm-1 of uncured liquid (0% cure) to cured coating (100 percent degree of cure). This is based on the relative ratio of the measured intensity of each peak relative to carbonyl intensity at ~1700cm-1 (constant). The 1400cm-1 stretch is absent in a fully cured coating, indicating the polymerization of the C=CH2 in the acrylic resin. This would be 100 percent degree of cure. The results are presented as the IR degree of cure. Two types of UV cure equipment were used for studies described in this paper. Miltec UV System, Inc., with conveyor system, equipped with four 320 watts/inch mercury standard medium-pressure Mercury Hg bulbs (Table 6). Samples were run with one pass for pre-cure and two passes for final cure, for a total of 1160mJ/cm2 UVA energy density. Baldwin 365 nm and 385 nm LEDs side-by-side, equipped with SF50 optics (Figure 2). Data recorded using an EIT Power Mapper for each specific UV regime: UVA, UVB, UVC and UVV. All samples coated utilized four passes of LED 385 nm and LED 365 nm at 20 fpm at a distance of 1.5 inches with no additional UV cure (Figure 2). The processing parameters and radiometry values are given in Table 7. Samples were cured in air or under a nitrogen atmosphere by using an enclosed metal chamber equipped with a quartz plate on top with an inlet and outlet for nitrogen purge and a removable sealed plate to allow for inserting samples. All samples were purged with nitrogen for a period of 30 seconds prior to LED/UV exposure to 385 nm and 365 nm LED lamps. DSC experiments were conducted using a TA Instrument Model Q-2000 Differential Scanning Calorimeter (DSC). About 5.0 mg of the samples were weighed into an aluminum pan and analyzed using a TA Instrument. Initial and reheat data were obtained while heating the samples from -50°C to 190°C at a rate of 20°C/min. in a nitrogen atmosphere. The samples were quench-cooled using the RCS-90 (chiller) between the initial and reheat scans. All mechanical testing was conducted using an Instru-Met instron at a rate 0.5″/min. Samples were prepared by using machined 0.5.00-inch X 6.00-inch template to prepare samples of coating/film composites. An approach to estimating the degree of cross-linking utilized a TA Instruments Model Q-800 Dynamic Mechanical Analyzer (DMA) with tension film clamp. Nominally, 0.6 mil coatings were prepared on a 2.6 mil PVC carrier film and cured by UV and LED in air and nitrogen atmosphere. A strain sweep at 100C was conducted to determine the degree of cross-link density of various UV LED formulations. An important goal of floor coating technology is to keep floors looking spectacular longer through improved scuff resistance, scratch resistance, stain resistance and cleanability. Scuff resistance is the ability of the flooring structure to withstand marks from shoe soles or high heels by providing a coating surface that exhibits superior wear resistance and easy cleaning. The scuff test was developed to determine how effectively coating formulations performed when marked by a rubber sole. After scuffing a sample, the sample is wiped with a dry cloth and rated based on visual appearance of the remaining scuff mark. A rating of 1 is given indicating no sign of scuff; rating 2 is the presence of scuff marks. Figure 3 provides a bar chart of scuff resistance for each formulation LED cured under air and nitrogen. Overall, the LED/UV formulation tested and atmosphere of cure, air vs. nitrogen, had little effect on scuff resistance, as noted by the 1 rating. This indicates that sufficient surface cure was achieved by using UV/LED arrays that resulted in a hard-cured surface to resist scuff marks. The control UV-cured using medium-pressure Hg lamps was found to give a rating of 1, indicating no marks present. The exception was Formulation A  cured in air  that exhibited scuff marks (Figure 4). This same coating cured in a nitrogen atmosphere did not show scuff marks, indicating a higher degree of cross-linking is achieved at the surface. Figure 5 summarizes the impact of formulation and atmosphere, air vs. nitrogen LED cure on Gardner Scratch as percent gloss retained in bar graph. All formulations within this study contained the same type and wt percent of hard particles. Virtually no effect from air vs. nitrogen atmosphere during LED cure was observed on Gardner scratch performance for LED formulations. Almost all formulations were rated as light damage, with gloss retention values after testing at greater than 89 percent, based on initial gloss before testing and final gloss measurements after testing (Figure 6). The influence of DBEW for Formulations A, 60; B, 67; and C, 76, did not have a dramatic effect on surface scratch properties, indicating that the resin materials were sufficiently cured to hold the hard particles within the matrix. Similarly, no effect from type of LED photoinitiator, TPO/ITX for formulation D, phosphine oxide-based TPO-L formulation E vs. 3-ketocumarine for formulation F was observed on Gardner scratch results. The exception was curing the UV control formulation by LED/UV arrays, where severe scratch damage was observed (Figure 7). This is due to insufficient cure of the resin matrix, giving rise to failure of the surface to hold the hard particles and leading to catastrophic failure. Color stability of the coatings after LED cure was determined by using an XRite SP64 flash spectrometer to record initial tristimulus L*a*b* values. In general, the bar graph indicates formulations D and E containing 3-ketocumarine initiators show more yellowing vs. formulations containing TPO and ITX (Figure 8) by the higher b* values. The control cured by UV was found to have the lowest b* value of 10.2, whereas formulations D and E, containing five percent of BL723 and LFC 3644, were found to have higher b* values of 14 and 19, respectively, for the same base resin compositions. The exception was Formulation H, containing TPO/ITX and a high MW aliphatic urethane acrylate, that was found to have a high color b* value of 16.3. Overall, the staining observed, with the exception of Formulations F and H, would probably not impact the color of medium or dark wood stains  such as gunstock, Sumatra, cherry, saddle, mocha or midnight. Lighter colors  such as natural and harvest  would be affected by the coatings initial b* values. Effect of process conditions on 1-minute iodine stain resistance as determined by the delta b* color value shows that UV LED cure under nitrogen performed better than LED cure under air atmosphere due to improved surface cure. The lower the delta b stain value, the better resistance to iodine staining observed, as shown in the bar graph in Figure 8. It is important to note that formulations having a higher initial b* value than the UV control will result in masking of the staining due to iodine and result in a false b* value. The best 1-minute iodine stain-resistance in air is observed for the UV control cured vs. the remainder of the LED formulations, indicating better surface cure using Hg lamps. Although Formulation F had the lowest recordable Delta b value after the 1-minute stain test, it also had the highest initial b* color that would mask the delta b value of the iodine stain. In comparing Formulations A, B and C in the series of increasing DBEW from 62 to 76, no trend in improved iodine stain-resistance was observed. Formulation A, with DBEW of 60, and formulation C, with DBEW of 76, have similar initial b* color values of ca 5.6, which is three times that of the UV control. Similarly, in comparing the LED photoinitiator series D, E and F, the TPO/ITX formulation D and phosphine oxide TPO-L based photoinitiator E were similar on stain resistance. The improvement in stain resistance under a nitrogen atmosphere is due to mitigation of oxygen inhibition during the UV-initiated polymerization (Scheme 1). Again, no trend was observed in increasing DBEW in the series A, B and C on stain resistance. In comparing the LED photoinitator series D, E and F, an improvement was noticed for Formulation E, containing the phosphine oxide blend (TPO-L) BL723 Db=0.74 vs. Formulation D, containing TPO, Db=2.7. In comparing the effect of mercapto-based resin vs. high-viscosity UA in the series G and H, an improvement in stain was observed for Formulation G, containing the mercapto-based resin LED2; Db= 0.8 vs. 4 for UA EB8807. The other factor contributing to improved stain resistance is the increase in formulation viscosity that helps mitigate oxygen diffusion into the coating. The control UV formulation cured in air was found to have 100 percent carbon-carbon double-bond conversion by IR using standard medium-pressure Hg arc lamp processing conditions of 1330mj/cm2 and 900mW/cm2. The same formulation designated as Base C1 cured by LED 385 nm and LED 365 nm in air was found to have a low IR conversion of only seven percent after eight passes to get a tack-free surface, which is twice as many as other formulations in this study. In contrast, curing the UV formulation under a nitrogen atmosphere using LEDs resulted in a high double-bond conversion of 88 percent. The difference in cure in air vs. nitrogen is well documented, where oxygen inhibition is interfering with radical formation-quenching reactions, and scavenging reactions (Scheme 1, Figure 9).5 The formulation G was found to have the highest double-bond conversion of 75 percent when cured under LED/UV air. This formulation has a DBEW of 76 and contains 47 percent of a highly functional urethane acrylate and ca. 25 percent of the mercapto-based resin LED 2 that results in a high degree of reactivity. In comparing the degree of double-bond conversion for the series A, B and C, no trend of increasing double-bond conversion with increasing DBEW was observed for the range 60 to 76. The range of double-bond conversion was 58 to 66 percent for LED air cure and 78 to 86 percent for LED nitrogen cure. The expected outcome would have been a higher double-bond conversion for Formulation C, with the lowest DBEW, due to less of an effect of diffusion limitations during acrylate polymerization. In the series containing different LED initiators D, E and F, the highest double-bond conversion was observed for formulation E, containing the phosphine oxide-based photoinitiator Omirad BL724, with 69 percent conversion in air and 87 percent conversion in nitrogen atmosphere. An improvement in double-bond conversion was noted in the series G and H, where the mercapto-based resin LED2 gave a higher double-bond conversion than the high-viscosity urethane acrylate EB8807 when cured in air or nitrogen atmosphere. In this instance, the mercapto-based resin had more impact on double-bond conversion than the high-viscosity UA. It was expected that the high-viscosity UA would have the potential to slow oxygen diffusion into the coating by increasing the overall viscosity of the formulation. The delta C=C change for air vs. nitrogen shows that the worst is the UV Base C1 formulation, followed by D (TPO/ITX), C (DBEW 76) and E (phosphine oxide-based photoinitiator). To gain an understanding regarding the cross-link density of the acrylate-cured coatings, nominally 0.6 mil films were prepared on a 2.6 mil rigid polyvinylchloride (PVC) carrier film and evaluated by mechanical tests. Percent elongation at break was determined at the point of breakage of the film composite structure. The function of the PVC film carrier is to provide a backing to allow for relative comparisons to be made between coating formulations that otherwise would be too brittle to test by using an Instron. All coatings were applied in machine direction of the film. The stress strain curve for the carrier PVC film exposed to UV process shows the yield elongation at 5.5 percent and break elongation of 125 percent. Test results for the UV-cured control coating on the RVF show a dramatic elongation at break to 37 percent, thus showing the influence of the coating on mechanical properties (Figure 10). Bar graphs for break elongation percent for each LED coating series studied are illustrated in Figure 11. The base coating/PVC laminate that was UV-cured was found to have a break elongation three to four times greater to that of LED-cured coatings. The elongation at break for the UV control was 37 percent versus 11 percent or less for all other LED-cured coatings tested. These differences are attributed to the overall total UVA and UVV energy density and peak irradiance by the two different cure methods. Both the energy density and peak irradiance are dramatically higher for LED-cured coatings vs. conventional UV-cured films. The total energy density for LED/UV cured films is UVA, 13.6J/cm2, vs. 0.9J/cm2 for the UV-cured film. UV LEDs have been reported to transfer 15 to 25 percent of the received electrical energy into light, with the remaining 75 to 85 percent transferred as heat.4 Even though the DBEW for the UV-cured coating is 60 vs. 62 to 76 for higher functionality LED coatings, the magnitude of difference is not expected. In comparing the effect of DBEW on break elongation in air, formulation B with a DBEW of 68 was found to have an elongation of 7.9 percent, which is similar to formulation C, with a DBEW of 76 and elongation at break of 6.9 percent. Comparison of PVC film composites composed of LED formulations E vs. F, with two different photoinitiators at five percent wt., had no effect on percent elongation at break. Similarly, virtually no effect on break elongation was observed utilizing a mercapto-based acrylic resin LED2 formulation G vs. the high MW aliphatic urethane acrylate in formulation H. Both formulations cured in air gave six to seven percent break elongation. In comparing break elongation of LED coatings cured in nitrogen atmosphere for the DBEW series A, B and C, the expected decrease in elongation is observed. The elongation decreased from 6.6 percent to 5.2 percent as the DBEW increased from 59 for A to 66 for B and 76 for C.
An approach to estimate the degree of cross-linking utilized a TA Instruments Model Q-800 Dynamic Mechanical Analyzer (DMA) with tension film clamp. Nominally 0.6mil coatings were prepared on a 2.6mil PVC carrier film and cured by UV and LED in air and nitrogen atmosphere. A strain sweep at 100°C to determine the degree of cross-link density of various LED formulations is illustrated in Figure 12. As expected, the carrier PVC film displayed the lowest storage moduli at 6.46MPa in comparison to the UV-cured control/PVC laminate, with a storage moduli of 18.1MPa. Increasing the DBEW from 67 to 76 for the LED-cured formulations B and G resulted in an increase in storage modulus from 23.3MPa to 27.5MPa for the laminate films as a result of higher functionality and crosslinking. Figure 13 and Table 8 summarize the effect of LED cure in air vs. nitrogen atmosphere on glass transition temperature (Tg) for various DBEW formulations. The expected trend of higher Tg for coatings cured in nitrogen vs. air was not observed for all coatings. Formulation A, with a DBEW of 59, shows a slight drop in Tg on going from air to nitrogen cure, whereas formulation D, with a DBEW of 76, shows the largest increase in Tg on going from air to nitrogen. For formulation C, DBEW 68, the Tg remained about the same, regardless of air vs. nitrogen cure. An attempt was made to correlate the glass transition temperature of each coating with the DBEW. The plot of DBEW vs. Tg in Figure 14 shows, for the most part, the expected trend is observed. As the DBEW increases within the formulation, the glass transition temperature also increases. Based on overall properties, double-bond conversion in air and low DBEW, formulation A was applied onto wood substrate that had the coating stack layers applied up to the topcoat layer and cured by UV LED in air. Gardner scratch results show little to no damage after 30 cycles using the BYK Gardner machine, indicating a hard surface was formed (Figure 15). Abrasion testing using the ASTM method D4060 for Taber abrasion showed final wear-through at 1058 cycles vs. the UV control at 1105 cycles, indicating no significant changes are observed due to the LED/UV topcoat. UV LED formulations with DBEW ranging from 60 through 76 containing high-viscosity urethane acrylates, mercapto-modified resin and photoinitiators specific for 365 nm and 385 nm LED spectral outputs can be used to give good surface properties for abrasion resistance and stain resistance for flooring applications  as long as initial yellowing is taken into consideration. Yellowing was found to be more prevalent using the 3-ketocumarin photoinitiator based on five percent wt used in formulations presented in this paper. Good scuff-, Gardner scratch- and iodine stain-resistance can be achieved using a combination of 365 nm and 385 nm LED arrays under an atmosphere of nitrogen. Curing in nitrogen atmosphere resulted in an increase in double-bond conversion and improvement in stain performance. The highest reactivity as determined by double-bond conversion was achieved using a combination of ITX and TPO photoinitiator followed by the phosphine oxide-based photoinitiator BL723. Mechanical properties of laminate films prepared and cured by 365 nm and 385 nm LED arrays could be related to DBEW for percent elongation at break and storage modulus. The large gap in percent elongation at break for the UV control, 37 percent, vs. LED-cured coatings, 5 to 11 percent, is attributed to the significantly higher amount of energy density and peak irradiance used for this LED/UV study. This work was supported by Dr. Brian Beakler as one of the innovation platforms to investigate UV/EB radiation cure technologies, as well as input from Dr. Brett Diehl. The formulation work and processing were carried out by the coatings lab group: Dan Baker, Rebecca Winey, Lauren Miller, Brenda Erisman and Jose Rodriquez. All analytical studies were carried out by the Testing and Analytical Group: Kayla Lowrie, Kerry Eckman, Susan Gramlich and Tiffany Hilliker. J.S. Ross, L.W. Leininger, G.A. Sigel, and D. Tian. A Brief Review of Radiation Cure Systems Used in Flooring, RadTech Conference Proceedings, 241  250; Baltimore, MD, April 9-12, 2000. Armstrong Wood Coatings Quality Journey, J.S. Ross and G.A. Sigel; RadTech Report, May/June2006, pgs. 39-47. Jennings, Sara, UV-LED Curing Systems: Not Created Equal,” Presented at 2016 RadTech International). Jo Ann Arceneaux, Mitigation of Oxygen Inhibition in UV-LED, UVA and Low Intensity UV Cure, UV+EB Technology, Vol. 1 No. 3, pp48-56. E.V. Sitzmann. Critical Photoinitiators for UV-LED Curing: Enabling 3D Printing, Inks and Coatings, Proceedings of Radtech UV.EB West 2015, Redondo Beach, CA, March 10, 2015. A. Freddi, M. Morone, G. Norcini. 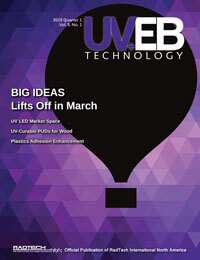 Design of New 3-ketocoumarins for UV/LED Curing, UV+EB Technology, Vol 2, No 3, pp 46-51. Gary A. Sigel holds a B.S. in chemistry/biology from Western Washington University and a Ph.D. in inorganic chemistry from the University of California, Davis. Post doctoral research on preceramic polymers to AlN/SiC solid solutions was conducted at Rensselaer Polytechnic Institute. He is a senior principal scientist with Armstrong Flooring and has 28 years of UV/EB coating and adhesive formulation experience with Armstrong, including six years as a UV coatings specialist in the companys wood division. He currently is responsible for the development and deployment of new UV coating systems/processes for residential and commercial segments of the flooring business. For more information, email gasigel@armstrongflooring.com.